I made a couple loaves of honey wheat bread last night in a fit of “I need to bake bread right now”… these fits come over me occasionally, and I have learned to never ignore them. Bad things happen when I do (extreme grumpiness, binge snacking, etc.). Even if I lose sleep because of it, baking homemade bread is always a good idea. So, of course all day those loaves were staring at me and calling my name over and over and over again. I tried to be good and only eat 2 12 slices, but I knew I needed to use up the rest of the bread to keep myself from snacking endlessly on it. Grilled cheese for dinner, it is, then. 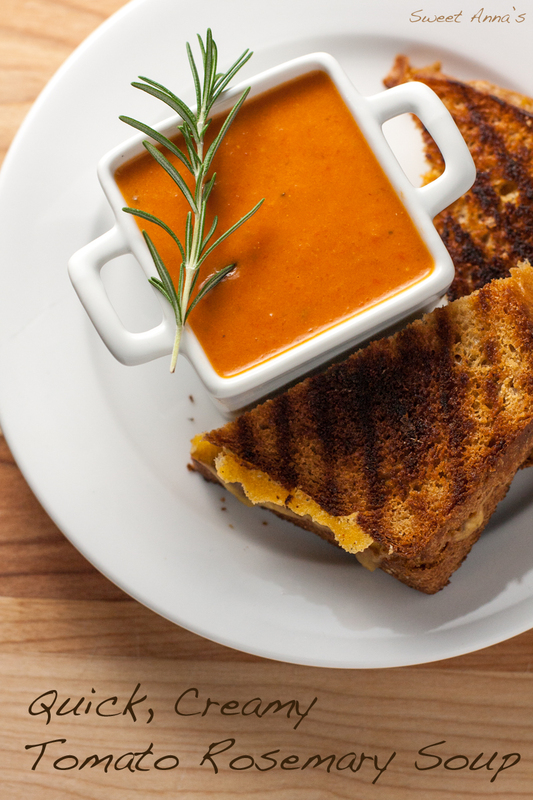 And what goes better with grilled cheese than a great homemade tomato soup? Nothing. That’s what. Nothing goes better with grilled cheese than a great bowl of creamy homemade tomato soup. Especially if said soup is rich and creamy and laced with fragrant fresh rosemary. So, here is my favorite tomato soup for you to try! It’s quick, it’s easy, it’s delicious, and it goes perfectly with grilled cheese sandwiches. Trust me. Dinner tomorrow. You won’t regret it! In a large dutch oven or deep sauce pan, heat the bacon grease (or olive oil!) over medium heat until it's nice and hot. Dump in the onions and carrots and sauté until just starting to turn golden, seasoning with the salt & pepper and stirring occasionally. Stir in the garlic and rosemary and cook for about 30 seconds, until very fragrant. Stir in the chicken stock, diced tomatoes and tomato sauce, stirring well with a wooden spoon to scrape any bits off the bottom of the pan. Bring to a boil over medium-high heat and then cover and reduce the heat to low. Simmer for at least 30 minutes, or as many as several hours, until you are about ready to eat. About 15 minutes before serving, stir in the softened cream cheese. Keep stirring occasionally until it is melted and then taste the soup for seasonings. Add some salt & pepper, and more rosemary, if needed to get the flavor you want. You can also add crushed red pepper flakes if you are anything like my family and like some kick to your soup! Serve with grilled cheese sandwiches, or garlic toast, and enjoy! If you like your soups creamy, PLEASE invest in an immersion blender. You will wonder how you ever did without one! This is what I have, but I’m sure as long as it’s sturdy, it’s fine. It’s just so much easier (and less messy!) than using a traditional blender. Worth every penny! « white chocolate cinnamon chip pretzel bark & BIG news!